COLUMBUS, Ohio (Oct. 23, 2015)  Band members from The Ohio State University will experience a trip-of-a-lifetime this weekend when the OSU Marching Band performs in London's Wembley Stadium at the NFL International Series matchup between the Jacksonville Jaguars and Buffalo Bills. The band's performance will be during the pre-game festivities on Sunday, October 25. This will mark the first time the band has brought its innovative field show style  and the trademark "script Ohio" drill  to a stadium overseas. The band will also perform on Saturday, October 24 for the "NFL on Regent Street" fan festival. In a video prepared by OSU student publication The Lantern, interim marching and athletic band director Chris Hoch revealed the band's plans for the London performance. "We're going to stick with what we do best. 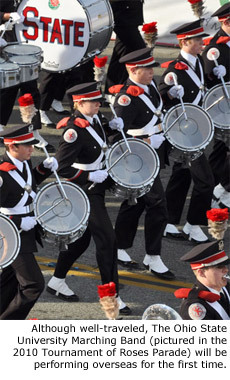 We're going to keep the OSU Marching Band style," Hoch said. "Some of the picture formations and things that you've seen from the band in recent years is what we're going to do over there. They wanted something that was us, they wanted us to perform like we do, so we are going to do the very best we can." Three matchups are on the schedule for the 2015 International Series. 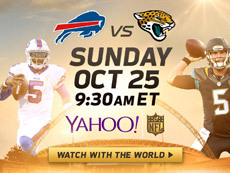 In addition to the Jaguars/Bills game, the Kansas City Chiefs and Detroit Lions will play on Sunday, Nov. 1. The Miami Dolphins and New York Jets played October 4, with the Jets winning by a score of 27-14. The Ohio State University Marching Band's appearance will be the first time an American marching band has performed at the NFL International Series. Source material courtesy of NFL.com and The Lantern/OSU. Photo by Marching.com.